Boasting more flavors than Baskin-Robbins, the measures run the gamut from familiar to rarely encountered. Performance on 33 quality measures across four patient care domains stands between accountable care organizations (ACOs) and the financial rewards for reducing costs and improving outcomes. However, insufficient capability to accurately and efficiently capture necessary data will put many of these fledgling organizations at an early disadvantage. Technology isn’t the only barrier ACOs face. There’s also a lack of familiarity with many of the measures they must track to demonstrate they are eligible to share in the savings realized by the Centers for Medicare & Medicaid Services (CMS) and Medicare programs. For example, measures reported through claims and administrative data will be relatively painless for most ACOs because reporting is a hands-off proposition. This includes ambulatory-sensitive admissions for congestive heart failure, chronic obstructive pulmonary disease, and asthma in older adults, which fall under the care coordination/patient safety domain. However, other measures, such as the Healthcare Effectiveness Data and Information Set (HEDIS), are more commonly tracked by health plans. Another critical component is that the measures also assess consumer feedback through patient experience measures collected by surveys. “Successful ACOs will incorporate these and other measures into existing quality improvement and care management programs to deliver the three-part aim: improving the experience of care, improving the health of populations, and reducing per capita costs of healthcare,” Penso says. In determining which measures would be most appropriate for achieving the end goals of its shared savings program, Health and Human Services (HHS) reached out to several organizations for advice and input. Among these was the Measure Application Partnership, a group of nearly 70 organizations, more than 30 subject matter experts, and nine federal agencies convened by the National Quality Forum that advises HHS on measures for a range of initiatives. Tom Valuck, MD, JD, senior vice president of strategic partnerships for the National Quality Forum, notes that the advisory group found much to like with the final ACO measures. Most are quality forum endorsed, and the four domains provide excellent coverage of national quality priorities. The domains focus on patient/caregiver experience (seven measures), care coordination/patient safety (six measures), preventive health (eight measures), and at-risk population (12 measures). Included in the latter domain are measures for diabetes, hypertension, ischemic vascular disease, heart failure, and coronary artery disease. 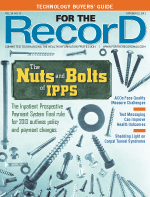 “The measures align across patient episodes of care, the various settings providing the types of care that a patient might need, and also across other federal programs in which the providers in an ACO might also be participating, such as PQRS [Physician Quality Reporting System] and meaningful use,” Valuck says. The ACO quality measures also align with the National Quality Strategy and other HHS priorities, such as the Million Hearts Initiative, which hopes to prevent 1 million heart attacks and strokes over the next five years. While the Measure Application Partnership is supportive of the measures the CMS ultimately selected, Valuck notes there is always room for improvement. For example, the group believes specific measures related to costs should have been included to increase ACO accountability. More patient-reported measures of health and functional status, as well as community supports, also were recommended. Measures in the latter area, which would include items such as personal care services, transportation, and day care, are still under development. “It’s a fledgling area for measurement. … We don’t do a good job of assessing the availability of those supports and connecting people with them,” Valuck says. How complex it will be for an ACO to successfully track and report on all 33 measures depends largely on stakeholder experience. For example, ACOs with health plan partners may have a leg up when it comes to several of the domains that consist of HEDIS and other metrics more commonly managed by payers. Physician-centric ACOs likely will excel at measures aligned with the PQRS and the Clinician and Group Consumer Assessment of Healthcare Providers and Systems (CG-CAHPS). Hospitals and physician groups probably are already comfortable with those measures that align with meaningful use criteria. The care coordination/patient safety domain, while not a surprise, will nonetheless require additional programs and processes to capture all the necessary measures such as medication reconciliation. Baskin predicts the at-risk domain will be the easiest of the four for ACOs to report, while preventive health will present the most barriers. That is because while it is an issue with which providers are comfortable, it’s not something that traditionally has been measured. “It’s not trivial. It requires following populations of members, which they may not be used to doing. It requires things like community outreach and population health, considerations for ways to reach members and patients who aren’t even necessarily coming into the office. Healthy people will still have to receive preventive care and the ACO is accountable even if they don’t show up in the office,” Baskin says. Some ACOs already are up for the challenge. Penso notes that member groups have been the “vanguard of the ACO movement in the country,” and the lessons learned from their experiences informed the creation of shared savings like programs at the CMS. Approximately 60 AMGA groups are currently participating in the Pioneer ACO or the Medicare shared savings programs. The AMGA is continually assessing the readiness of its groups to capture and use data to achieve clinical and business objectives. Success requires ACOs to have a “more detailed understanding of their aligned population’s health risk factors, utilization patterns, and gaps in quality of care to achieve the three-part aim. Advanced analytics, benchmarking, and the ability to share data and best practices with other ACOs will be key drivers of success,” Penso says. For its part, the AMGA implemented the Anceta Collaborative Data Warehouse, a data analytics engine that drives robust benchmarking and shared learning between physician organizations. Aetna offers Aetna Accountable Care Solutions, a dedicated department providing expertise and a suite of payer- and patient-diagnostic IT and care management solutions to support ACOs. This includes software that facilitates information sharing across and outside the ACO and tools to help filter information to ensure that providers are getting just what they need when they need it. Ferry concurs that an EMR is not sufficient to ensure ACOs are accurately capturing quality data to drive the improved costs and outcomes necessary to participate in shared savings. They must have technology in place that captures not only data about the performance of the ACO’s providers but also about its community partners. He points to Indiana University Health Bloomington, which worked with Curaspan to deploy an IT framework that provides detailed readmission reports sorted by a postacute provider. It helped the hospital, which was selected as an ACO, to better manage relationships and outcomes. One result was a 5% reduction in readmissions from skilled nursing facilities. Reduced readmissions and other quality improvements cannot be accomplished by EMRs and EHRs alone, according to Ferry. What is needed is easy-to-use technology that drives adoption by providing utility to the end user. As is often the case when it comes to leveraging data and analytics to improve quality and costs in healthcare, the discussion turns to the need for standards and standard terminology. Rosemary Kennedy, PhD, RN, MBA, FAAN, vice president of HIT for the National Quality Forum, says work is under way to build the HIT infrastructure needed to operate behind quality measures so data can be used at the national level to drive systemwide improvements. Specifically, the Quality Data Model, an “information model” that defines concepts used in quality measures and clinical care, is intended to automate EHR utilization. It enables clinical concepts to be described in a standardized format so those monitoring clinical performance and outcomes can clearly and concisely communicate necessary information. The model will facilitate broader use of clinical information captured by ACOs and others for quality reporting, Kennedy says. “This helps from two perspectives. First is the ability to analyze and aggregate quality measurement data at a national level. Second, it enables clinical decision support so clinicians can be guided real time at the point of care. It’s two parallel paths and we are looking to align them,” she says. When it comes to meeting quality benchmarks, patient education cannot be overlooked by accountable care organizations (ACOs). First, as targets of the caregiver experience, patients will be active participants in the survey process. Second, because they are being asked to assume a greater and more proactive role in their healthcare, patients need to understand how their actions or inactions impact their overall health and well being and quality outcomes. Andrew Baskin, MD, national medical director for quality and provider performance measurement for Aetna, says patient education is particularly important in terms of reaching those who may not realize they are part of an ACO so they can understand the available benefits. Also important is ensuring that patients who may not interact regularly with their physicians understand why they are being contacted by an ACO, particularly regarding preventive care. “To get optimum care, it helps to be a willing and knowledgeable participant,” Baskin says. “A healthy person may be contacted by the ACO saying, ‘You’re 50 and it’s time for a colonoscopy.’ You may not have gotten that before when no one was accountable for your total health. If you know why you’re being outreached and understand that it’s in your best interest and coordinated care is better care, that can only be a good thing.